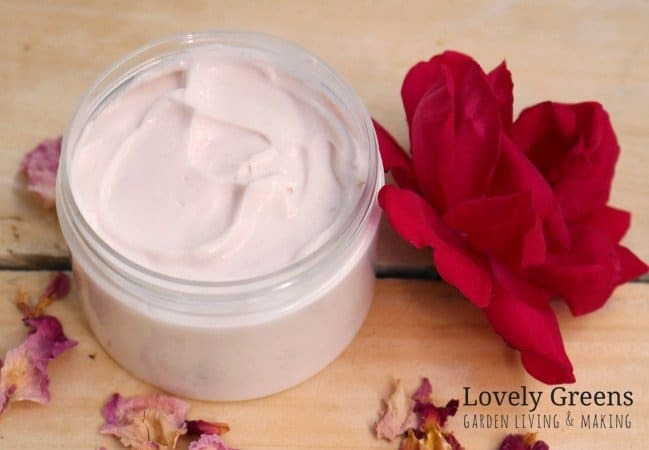 Homemade rose petal body cream made with fresh flowers, rich oils, and beautifully scented essential oil. 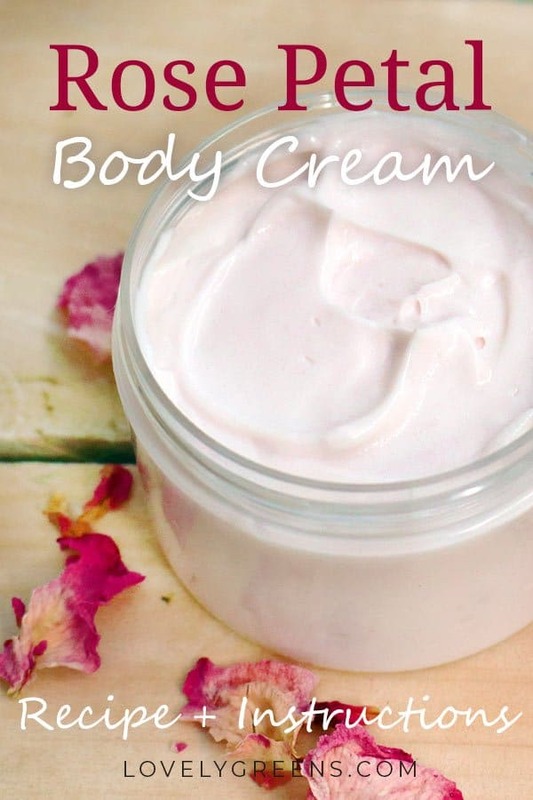 A body cream that tones and smooths while plumping the skin. Roses have many skin beneficial properties and extracts from their petals are shown to be anti-inflammatory and moisturizing. 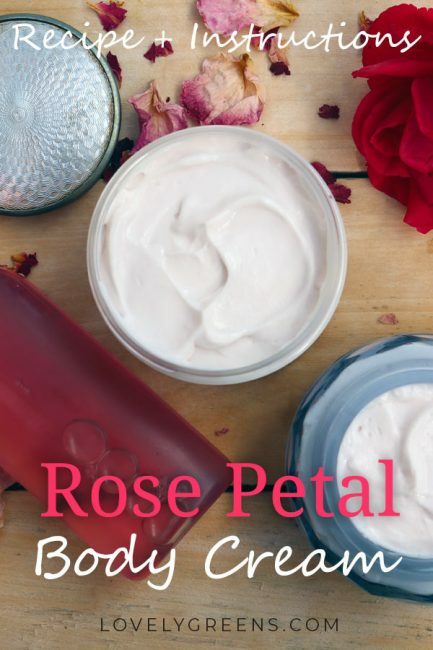 That means that while it’s working to soothe redness, it locks moisture in making your skin appear just as smooth and soft as the rose petals themselves. Rose extract also works as a gentle toner, balancing your skin’s pH while leaving a lingering rosy fragrance. 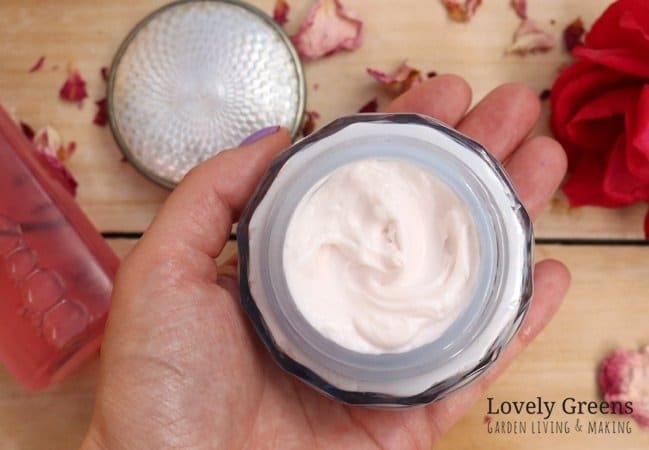 Using homemade rose water, I’m going to show you how to make your own DIY rose petal body cream. It’s light pink in colour, thick like a mousse, and feels incredible as you massage it in. From start to finish it will take you about thirty minutes and can be very inexpensive to make. 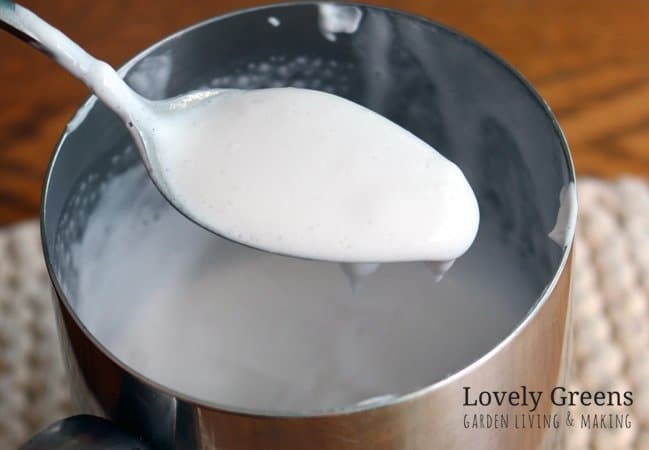 Continue on to making the lotion below and also head over here for even more lotion recipes. 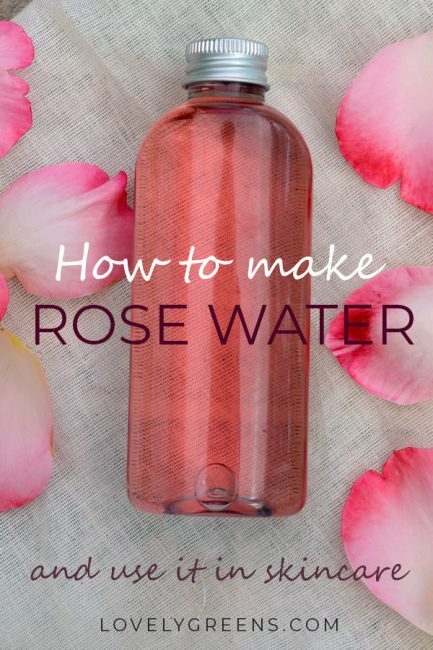 The first thing that you’ll need to do is make a batch of homemade rose water. It’s very easy to do and is essentially an infusion of fresh rose petals. You gently heat them with water and when they’ve lost their colour you strain the pink liquid from them. You can find the full instructions on making it over here. If roses are blooming for you right now, pluck some from your own garden to make the rose water. My favourite type to use are deeply scented wild roses. Alternatively you can invest in a gorgeous bottle of genuine rose water. 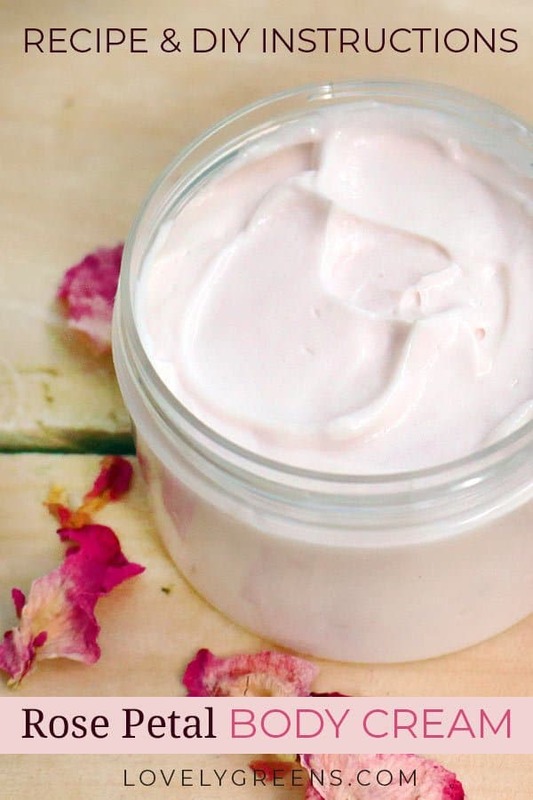 It will have a lot more natural rose fragrance than your homemade versions and the rose extracts will be more intense. Most of the equipment you’ll need is likely already in your kitchen. I highly recommend you invest in the digital scale to ensure your recipe is accurate. I’ve included volume measurements though for if you’re not able to get a hold of one. The oils I’ve chosen for this recipe are jojoba and sweet almond. Jojoba is very close in structure to human sebum so makes an excellent base for a natural cream. Sweet almond is much lighter and will balance any potential oily feeling. 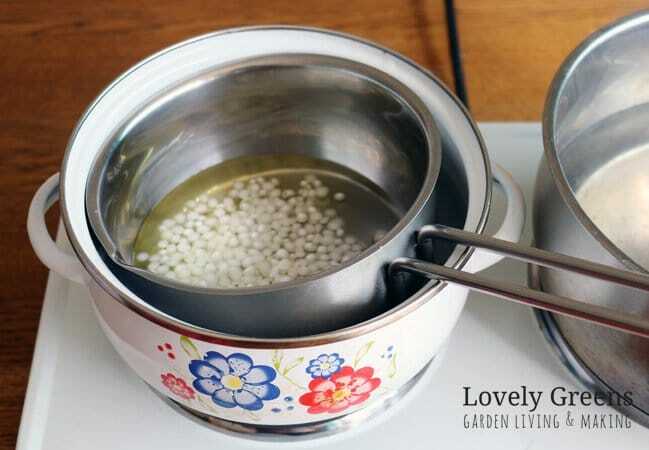 Measure all of the oil phase ingredients into a small sauce pan and the rose water into a heat-proof jar or container. 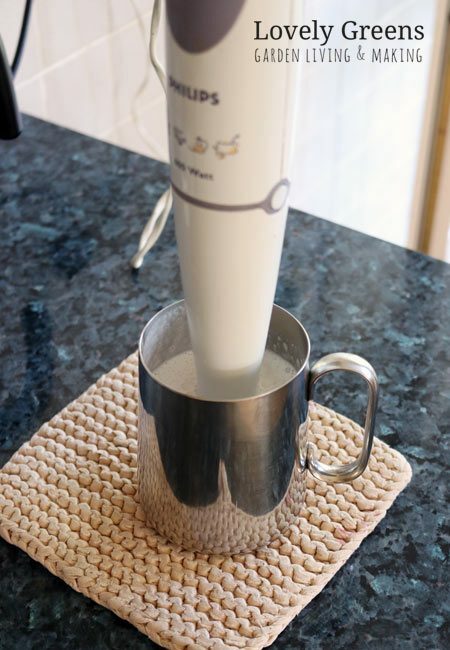 The milk frother or immersion blender should be able to fit inside the container. Heat both using the double boiler technique — float the pan inside another one filled with hot water. Heat on medium to medium-high until the oils and wax have melted. The oils in the pan and the rose water should be about 150°F / 66°C. Through experience I’ve found that you don’t necessarily need to measure the temperature. Leaving the oil to heat in the pan for a few minutes after it’s melted suffices. The water should be heating at the same time. If you want to be accurate though, invest in a Digital Temperature Gun. They’re not too expensive. Pour the melted oil phase ingredients into the container of rose water. I love using this metal travel mug that I nabbed off my partner. You’ll notice that the water will go opaque very quickly. Now submerge your immersion blender into the mug. You can also use a small milk frother for this but the former will speed up the process. 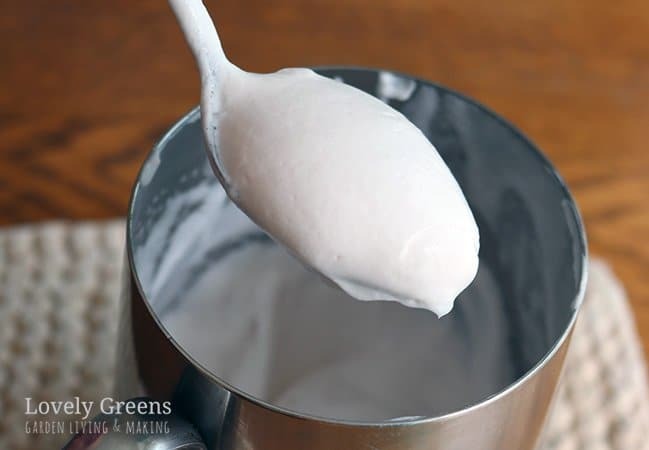 Blend until the mixture thickens up and it will literally take only about a minute or less. It will still be a bit runny. Think slightly beaten double cream. The thickening will tell you that the emulsifier has done its job of bonding the oil and water together. Blending without either — using a spoon or something similar — will take a lot longer. If you try this, you’ll need to definitely get a digital thermometer or temperature gun. You don’t want the emulsifying wax to start hardening up before its had the chance to do its magic. Let the lotion cool down to about 122˚F (45˚C ) before stirring in your essential oil, vitamin e, and preservative. It will have thickened quite a bit more by this time and you’ll be able to spoon it up. 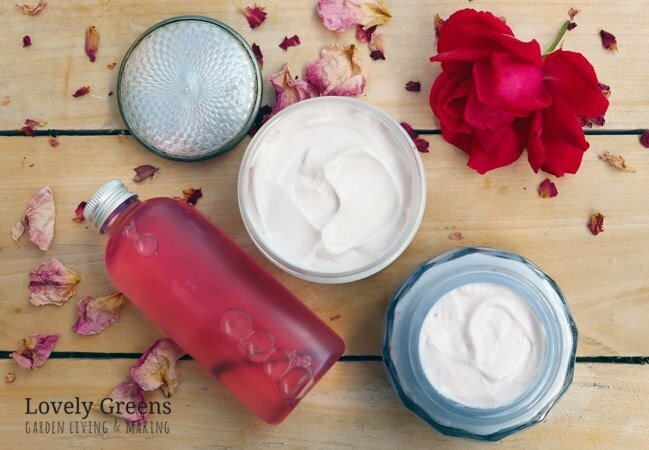 With lotions and creams you really need to make sure that the pH is in the appropriate range of 4.5-5.5. pH measures how acidic or alkaline a solution is and if your beauty cream is out of that range then it can make your skin feel dry and tight. Oftentimes it’s the preservative that can lower the pH in a recipe. 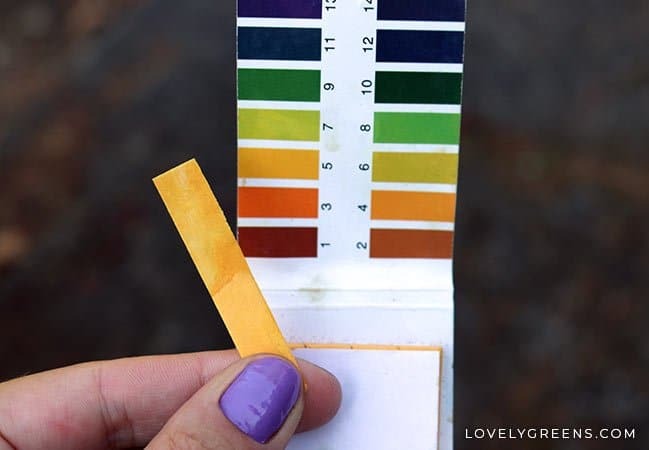 If you use a preservative other than Geogard Ultra then testing with pH strips is going to be very important. When I tested my recipe it gave me a reading of about 3.5 so I adjusted it by adding a tiny amount of baking soda (bicarbonate of soda). I mixed 1/16tsp (0.25g) of baking soda with 3/4 tsp water (3g) and stirred it into my lotion. Afterwards I got a much better reading. If you find that for some reason your lotion has a higher pH, you can bring it back down by mixing in a tiny amount of citric acid. Make sure to mix any powders in a tiny amount of hot water before you stir it in though. 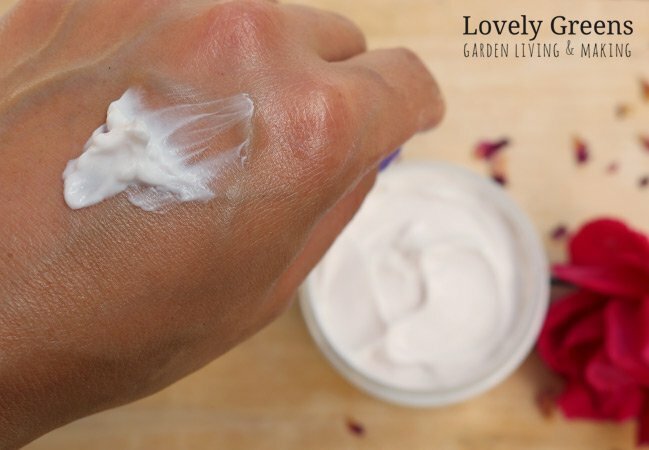 Once you finish making the body cream and pot it up, it will have a shelf-life of up to 18 months. It’s longevity is dependent on the preservative you use though — refer to your product’s details. If you choose not to use a preservative, you should really aim to use the cream within a week and ensure that it’s refrigerated. Any longer than that and bacteria and microbes will start colonizing your body cream. You really don’t want to be putting them on your skin. 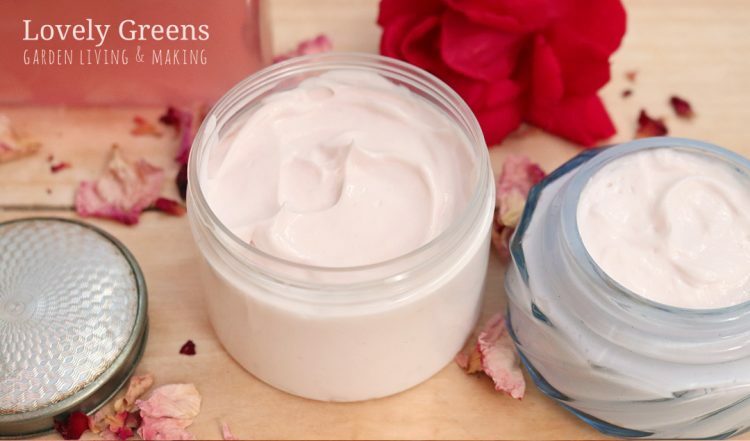 This rose petal body cream is thick and creamy and perfect for moisturizing hands and body. It may be a bit too thick to use on your face but I’ve just tried and like the feeling. If your skin is feeling tired and dry, this is the cream for you. Interested in more beauty recipes? If you’re interested in learning to make more of your own beauty recipes check out my natural soap making series. I even have a guest recipe for making Old Fashioned Rose Soap. For even more lotion and cream recipes head over here. I’ve shared recipes for organic aloe face lotion and calendula flower body lotion among others. Thank you for sharing this recipe. Can beeswax be substituted for the emulsifying was? Only if you also add Borax, which is actually not recommended in skincare anymore. Otherwise it wouldn’t create a truly stable emulsion. Thanks for such a detailed tutorial. This cream looks really effective. Thank you so much for sharing your recipes. There was a giant rugosa rose in the garden when I was growing up and I’ve always loved the scent so I’m looking forward to making this body cream. Sunflower and macadamia nut oils could be good substitutions. Hi again Tanya : )…Another question…if you have to raise the pH for a moisturizer you are selling what do you use? You mentioned lye…how would you use it? Is there anything else you can use given that baking soda is for home use products? Also, in what proportion would you use it to raise the pH of the formula? Same with the citric acid to lower the pH…in what proportion would you use it in the formula? I can’t give you advice on adjusting for commercial use — I don’t sell preserved creams and lotions and tend to only make them for home. For commercial products in the EU you have to send a sample of your product to a 3rd party analyst to test for microbes after certain periods of time. Without this test, you’re not legally able to insure or sell water-based cosmetic products. I’d hope it were the same in north america but somehow I doubt it? As for how much to use in adjusting. I mix a tiny amount into warm water as indicated in the recipe. Measure and pour a little in, mix it, and after a few minutes take the pH again. It’s the same for bicarbonate (baking soda), citric acid and sodium hydroxide. With the latter you need to be especially careful though. It’s much stronger a base than the bicarbonate. Make sure to always keep notes of how much you use so that you can make the recipe again. It’s through trial and error that you create a recipe that you can whip up time and time again. Hi Tanya ☺… I have Leucidal preservative. Can you tell me what they mean when they say “use between 2% to 4%”? 2 to 4 % of what specifically? You’re so welcome 🙂 There are a few ingredients you can use to bring the pH up a bit. Baking soda (Bicarbonate) is one that you can use for home use — probably not for skincare that you sell though. Another one is NaOH — Sodium hydroxide, also known as lye. You’ll see that in the ingredients list of some commercial creams and lotions. To lower the pH you can use lactic acid or citric acid.